Ideal for large e-Commerce sites. 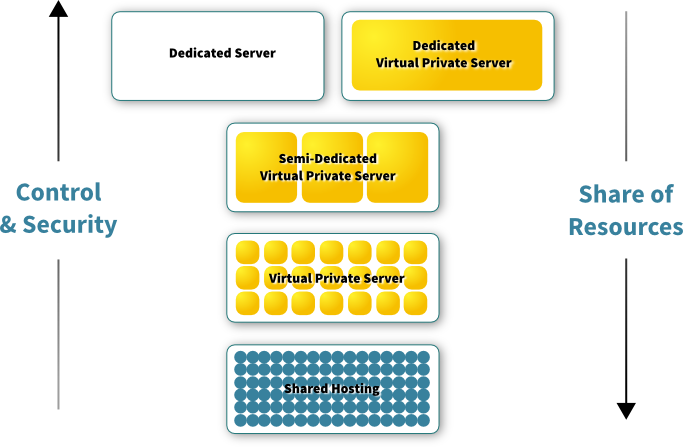 What is a Semi-Dedicated Virtual Private Server? A Semi-Dedicated Virtual Private Server is the next step along the resource migration tree. With a Semi-Dedicated Virtual Private Server, the number of VPS on a node is limited to better guarantee the resources available to you. At it's most dedicated, only your VPS is housed on the node, creating a Dedicated Virtual Private Server or Hybrid Virtual Private Server. Check out our Dedicated Virtual Private Servers. A dedicated server provides the ultimate control for your server but it comes at the cost of being the most difficult to set-up and maintain.